The University of Alberta has announced a new advocacy and research consortium to support military, veterans, public safety personnel and their families. Called ‘Heroes in Mind, Advocacy & Research Consortium (HiMARC), a partnership with various agencies to create several initiatives and research projects. 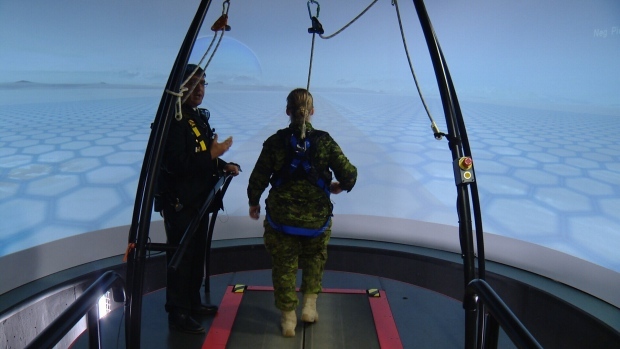 One of those research projects is the 3MDR study, which will allow Canadian Armed Forces members with PTSD to try virtual reality therapy. 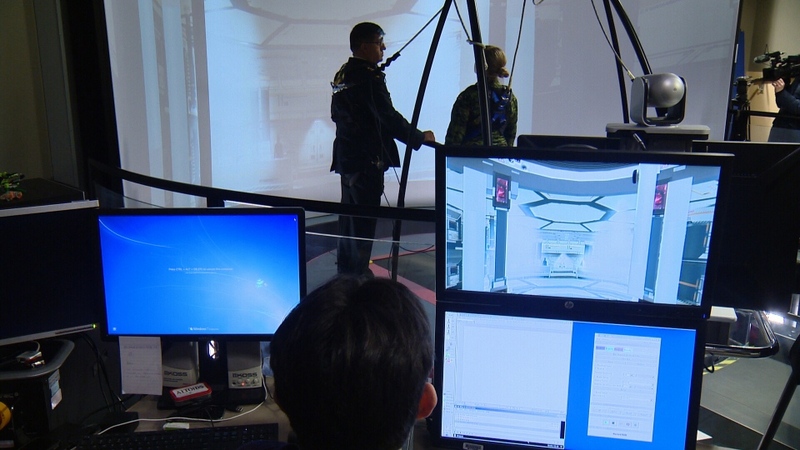 “Many of the members have had treatment-resistant combat-related post-traumatic stress disorder,” said Suzette Bremault-Phillips, HiMARC director. Using equipment already in place at the Glenrose Rehabilitation Hospital, the therapy combines walking, talking, and eye movement with virtual reality. Participants walk on a treadmill towards an image protected on a screen. “The intervention is multimodal in its effect. It empowers an individual to move towards a trauma rather than being stuck within it,” said Bremault-Phillips. 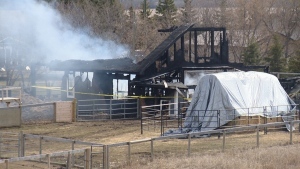 “It doesn’t necessarily need to be the picture of the actual incident that happened. It could be a picture of something that stimulates it or evokes it,” she said. “The sensations that I was feeling and the emotions and the memories that I was able to access were a lot more readily accessible to me because of this,” said Capt. Anna Harpe after trying the 3MDR system. Capt. Harpe served nearly nine months in Afghanistan. She doesn’t suffer from PTSD but is now a social work officer at CFB Edmonton. “As a clinician, having worked with individuals in an office setting, it’s hard to elicit these emotions because effectively you’re asking the individual to remember their memories in their mind and often people just get overwhelmed,” she said. Throughout the virtual reality experience a therapist is there to offer guidance, support and to ask questions to help the patient combat the fear. “Hearing that safe voice kind of guides you through it, asking you questions, it grounds you a little bit,” said Capt. Harpe. 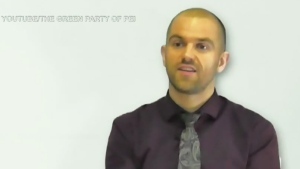 “If this was my greatest fear I would imagine that would be terrifying. But to be able to face it over and over again that gives you a sense of empowerment,” she added. “So we coach them, we stand next to them and say we’re going to do this together,” said Col. Eric Vermetten, head of research in the military mental health unit in the Dutch Ministry of Defense. The therapy was developed in the Netherlands by Col. Vermetten, who came to Edmonton to help launch this Canadian study. “Typically why therapies fail to work is cognitive avoidance, I don’t want to go there, don’t want to be exposed, it’s difficult for me. This opportunity is at your face, you select the pictures and you walk into your own memories and we help them,” Col. Vermetten said. Forty-five CAF members have been selected to take part. Th study itself will take about two years to complete. “Turning people’s lives from misery to returning back to their happiness and livelihoods, I think that’s amazing,” said Capt. Harpe. 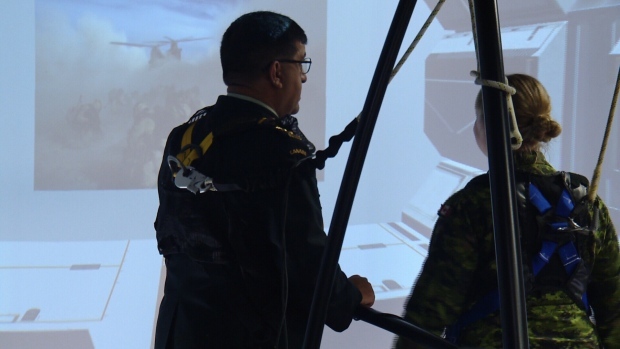 CAF member tries virtual reality equipment which will be used for PTSD therapy.